If you have questions or would like to share new data from national IDD/USI surveys for inclusion in the next Scorecard and map update, please contact us. 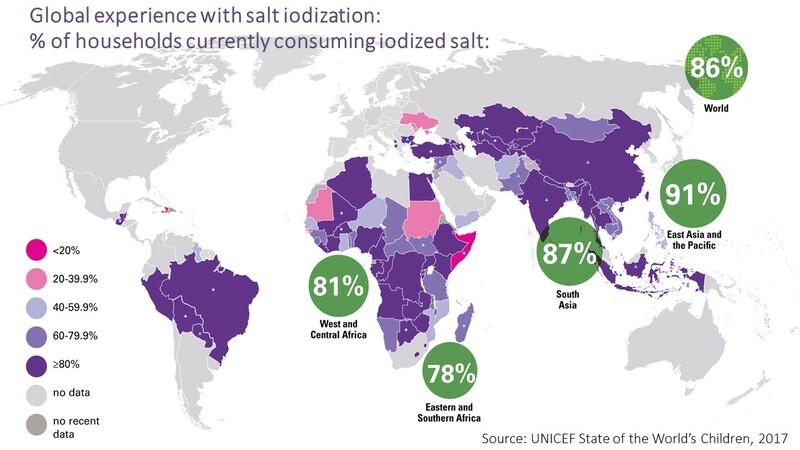 The latest map indicates that 108 countries have legal documentation requiring mandatory fortification of salt with iodine. It is correct as of 7th May 2018. It is sourced from the Global Fortification Data Exchange (GFDx) , a new tool created by a consortium of partners in food fortification: Food Fortification Initiative (FFI), Global Alliance for Improved Nutrition (GAIN), Iodine Global Network (IGN), and Micronutrient Forum. Visit the GFDx website to access and download the latest interactive maps and visualizations of data on fortification of salt, maize, oil, rice and wheat flour. Presented as a poster at Nutrition 2018, the American Society for Nutrition annual conference, on 9-12 June, 2018, Boston, MA, USA. These maps show global progress made at the national level since the first global scorecard was published in 1993 to the most recent update in January 2015. The darker the colour, the more severe the iodine deficiency as a public health problem. Before 1990, only a handful of countries were iodine sufficient. As a result of remarkable efforts in the past two and a half decades, the latest global estimate of iodine nutrition looks more optimistic than ever. Here is a summary of the most important changes since 2012.